Argentina’s fourth largest city, Mendoza, doesn’t feature a large variety of ethnic foods like Buenos Aires– thankfully. Because what Mendoza does really well is the Argentine parrilla, or grilled meats, and pasta. The city, located in the country’s richest province and the heart of wine country, has world class dining alongside classic parrillas that will find the perfect match to your grilled selection. With two locations just outside the city center, the only drawback to this fine parrilla is the required taxi ride. Once there, you will enjoy authentic grilled entrees of beef, lamb or fish, coupled with a wine section that counts over 45 bodegas and hundreds of wines. Boasting a large interior patio, private rooms and an extensive wine cellar, this restaurant is an excellent choice for an upscale dinning experience. 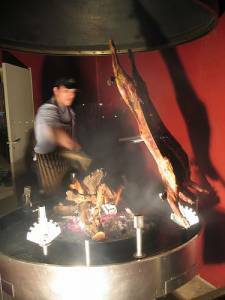 Although their specialty is parrilla, the menu is quite extensive. Calle Sarmiento, best known as the pedestrian shopping street in Mendoza, transforms into a parrilla paradise after crossing to the west side of Plaza Independencia. Although it is no longer pedestrian only, the great selection of restaurants offers interior and street side seating options. The following three parrillas are located here. An excellent parrilla, located one half block west of the city’s center plaza, boasts some of the best parrilla for the best prices in Mendoza. Specializing in parrilla, this restaurant has anything but a limited menu. 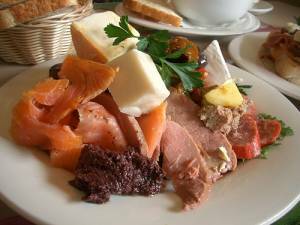 Meals to suit any craving coupled with a good assortment of wines and a comfortable atmosphere make this a popular choice among the budget conscious traveler. This casual parrilla restaurant is happy to boast something of a rarity in Mendoza: an extensive, all you can eat salad bar. Coupled with a casual atmosphere and twenty years of quality service, this restaurant will not disappoint. Although only open evenings, Wednesday thru Sunday, this gourmet restaurant is simply one of a kind. Chef Rodrigo Lillo will impress you with his nightly menu and extensive wine knowledge. Located on the tenth floor of a centrally located building, its hard to decide whether Decimo’s best feature is the gourmet food, endless wine list or amazing city views. Mixed together, this restaurant might just be Mendoza’s best dinning experience. Located inside the impressive five-star Park Hyatt Mendoza hotel, Bistro M serves traditional dishes with French influences. The English speaking sommeliers and haute cuisine make this an excellent choice. Although it only opened in 2004, Francesco is linked to Mendoza’s original Italian restaurant that opened in 1948. The traditional dishes, all prepared with the freshest ingredients, will all be perfectly matched by a recommended wine. Another excellent traditional Italian restaurant, with two locations, is an excellent choice if you are looking for great specialty pastas. 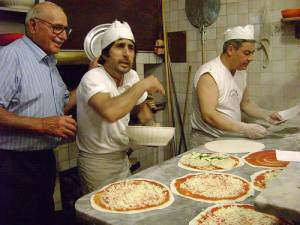 They pride themselves on practicing the art of Italian cuisine. Although they offer a diverse menu of pastas, beef, fish and seafood, the homemade pasta is their specialty. 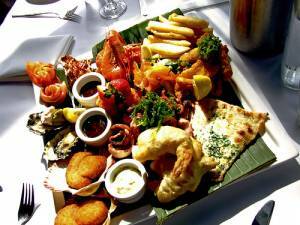 Home to an excellent tapas menu of mostly seafood dishes, this restaurant is also known for its intimate style. Mar & Monte specializes in seafood imported from Chile in two great locations. The conveniently located downtown eatery is countered with an intimate experience in their Chacras de Coria location. The fact that during any major football games the bartenders hand out free shots of tequila after any goal scored by the supported team tells you much about this pub. Good music, good food and friendly people are all on the menu. Good atmosphere, although often overly crowded, makes this an ideal spot for a pizza and cold beers with friends. 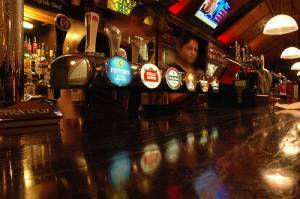 Good pub fare such as pizza, hamburgers and lomo sandwiches highlight this smaller, quieter nightspot. Open Thursday-Saturday evenings, this restaurant offers a unique Middle Eastern ambience and delicious meals. Be prepared to experience a unique oriental evening! 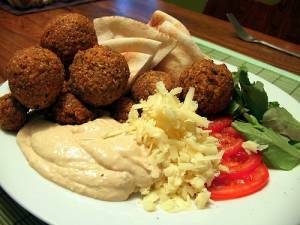 This excellent Middle Eastern restaurant concentrates more on the meal than the ambience. Open on Friday and Saturday evenings only.